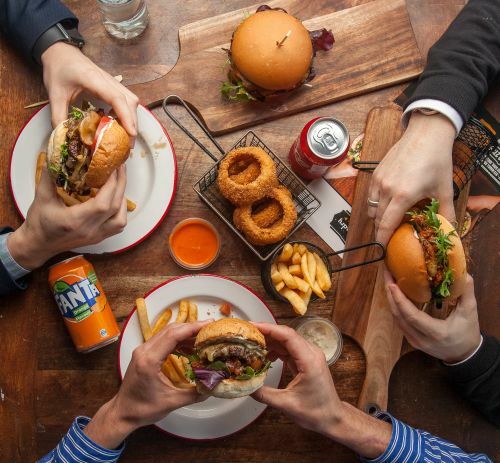 Menulog delivers for Burger Foundry - St Morris so you'll be able to track your courier on a map. Mesclun greens, tomatoes, cucumber, Spanish onions and avocado. Served medium. Foundry grilled Australian black Angus steak burger. Topped with crispy bacon, caramelised onions, tomato slices, Swiss cheese, aioli and mesclun greens. Foundry grilled meat patty with roasted walnuts, sweet caramelised onions, blue cheese, aioli and mesclun greens. Foundry grilled meat patty, spicy chipotle chilli, tomato salsa, smoked barbecue sauce, Cheddar cheese, aioli and mesclun greens. Foundry grilled meat patty with sweet beetroot slices, thick tomato slices, crispy smoked bacon, sunny side up egg, relish, matured Cheddar cheese, aioli and mesclun greens. Foundry grilled meat patty, thick tomato slices, Cheddar cheese, aioli and iceberg lettuce. Foundry grilled meat patty with sweet caramelised onions, thick tomato slices, crispy smoked bacon, matured Cheddar cheese, aioli and mesclun greens. Foundry grilled meat patty with sweet caramelised onions, juicy mushrooms, thick tomato slices, Swiss cheese, aioli and mesclun greens. A super slider beef patty with tomato, lettuce and aioli. Served with chips and drink. Foundry grilled chicken thigh fillet with creamy avocado slices, cucumber slices, thick tomato slices, buttery brie cheese, aioli and mesclun greens. Foundry grilled chicken thigh fillet, thick tomato slices, aioli and iceberg lettuce. Caribbean seasoned, foundry grilled chicken thigh fillet with thick tomato slices, sweet tropical mango salsa, aioli and iceberg lettuce. A super slider chicken thigh fillet with tomato, lettuce and aioli. Served with chips and drink. Field mushroom burger patty made with South Australian mushrooms, thyme and onions. Topped with thick tomato slices, sweet beetroot, aioli and mesclun greens. Sweet potato, chickpea patty and caramelised onions topped with vegan relish, tomato salsa, chipotles sauce, avocado and mesclun greens. Slow cooked to perfection and marinated with foundry spices and finished off on the grill. Made with Australian potatoes with foundry ground rosemary salt. Choice of five or ten wings with honey barbecue buffalo or honey soy sauce. VG = Vegan. GF = Gluten Free.